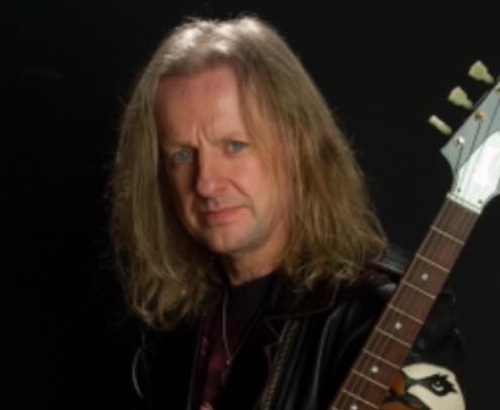 In a recent interview with Backstage Axxess, Judas Priest bassist Ian Hill was asked why guitarist K.K. Downing was not asked to re-join after Glenn Tipton had to step aside due to his battle with Parkinson’s. K.K. Downing’s autobiography, “Heavy Duty: Days And Nights In Judas Priest”, will be released on September 18th through Da Capo Press. Read more about this forthcoming release by clicking here. In that PRIEST vs. MAIDEN throw down, I think PRIEST only wins because they were around first. Each musician in each band is top notch and the song writing is also equally great. As far as this feud goes, if K.K. wants back in, they should make that work. What PRIEST fan wouldn’t want him? Especially if this is the final tour. As far as these guys fighting with each other goes. Look at the song titles: SCREAMING FOR VENGEANCE, THE RAGE, SOME HEADS ARE GONNA ROLL, DISSIDENT AGGRESSOR, MAN ON THE EDGE, WRATHCHILD, GANGLAND and BRING YOUR DAUGHTER TO THE SLAUGHTER. Yeah tempers may flare up. I agree with Dana on this. No bands that have lasted as long as Judas Priest are going to get along great their whole career. All bands have their ups and downs between members, and Priest lasted longer than most. That being said, it sure sounds to me that KK really regrets leaving the band. It could be that, given the recent financial setbacks he’s had, he sort of wishes he was still in Priest getting paid. I don’t blame Ian for sticking up for the band in its current format. KK made the decision to leave the band, and Priest has moved on. KK should just move on and, if he’s so inclined, line up some musicians and put out some new music. And I also agree with Dana that I hope the guys can just bury the hatchet and move on.